In your home, safety should be your first priority. After all, your home is where you’ll keep your valuable possessions. More than that, your home is where you and your loved ones will spend so much of the time, so you need to take any precautions to keep your home as safe as can be. 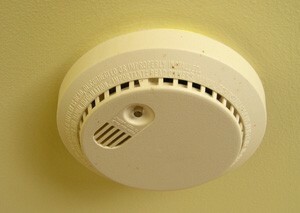 And one important step for keeping your home that safe is to equip it with smoke detectors! Fires are one of the most prevalent and most DESTRUCTIVE issues that can develop in your home. While you can’t always prevent them from happening, you can prevent them from surprising you by getting a smoke detector installed in your home. If you are in the market to keep your home and family protected against fires, then call on the local San Antonio electricians at John Jones Electric for a quality smoke detector installation! The saying “the more the merrier” is never truer than when you’re talking about smoke detectors. After all, one or two central detectors won’t be enough to provide the most thorough protection possible for you -- not if a fire happens somewhere out of their reach. Perhaps the most obvious choice. The kitchen is the room in which the chance of a fire occurring is the highest because of your stove and the like. With its heavy machinery -- particularly the dryer -- as well as your hot iron, your laundry room also poses a fairly high risk of fire development. Your bathroom contains a couple of items that pose a significant fire risk: your hair dryer and hair straightener. While your bedrooms don’t pose the fire risk that other rooms do, you do want to be sure you can hear your smoke detector loud and clear should a fire occur while you’re sleeping. The local electricians at John Jones Electric are thorough and dedicated enough to hit ALL of the main locations when installing smoke detectors in your home. Thus, with John Jones Electric, you can be sure to enjoy the most all-encompassing fire protection possible. The world can be a scary place. Don’t believe us? Just turn on the news for a couple minutes. You can’t stop all the scary, dangerous things from happening out in the world, but you can take measures to protect you and yours from those very things. And, of course, maintaining reliable smoke detectors in your home is one of the best steps you can take in that endeavor. And having your smoke detectors installed, tested, and replaced as need be by the experienced local electricians at John Jones Electric, you can be sure to enjoy the greatest protection from one of life’s most common and destructive threats: fires. Your home should be, above all else, safe. You should be able to relax in your home with your loved ones and know that you’re all as protected as can be. And with smoke detectors provided and checked on by the pros at John Jones Electric, you can enjoy being as safe and protected as can be!